Works by the artist John F. Peto are in the permanent collections of major museums including the Newark Museum, the Smithsonian American Art Museum in Washington and the Museum of Fine Arts in Boston. But even locals in the small, waterfront town of Island Heights, where he lived and worked from 1889 until his death in 1907, are not always familiar with his name. Ms. Askoff has lived in Island Heights, population around 1,750, for 61 years; she remembers when Joy Peto Smiley, Mr. Peto’s granddaughter, operated the house where the artist kept his studio as a bed-and-breakfast. Ms. Smiley died in 2002. Mr. Peto is known for still-life painting in the trompe l’oeil style; his works and belongings dot up to nine exhibition rooms within the 12-room house, which opened as a museum in 2011 after a two-year, $2 million restoration. 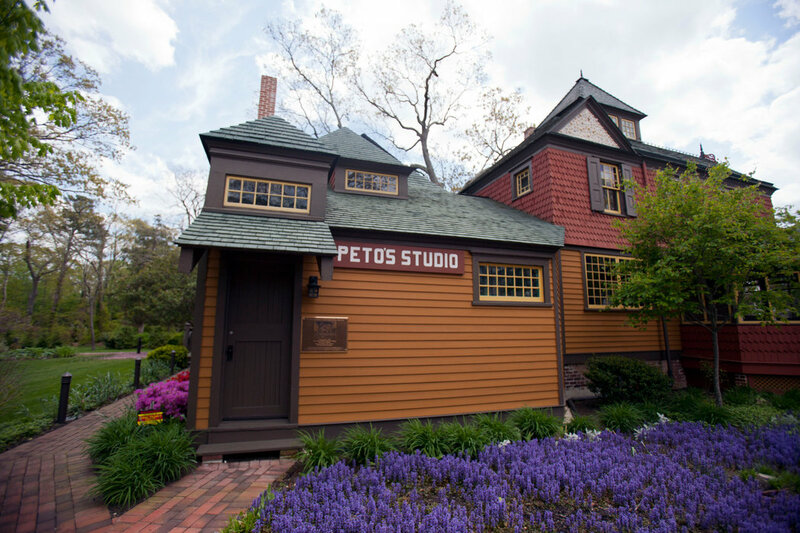 Mr. Peto had the shingle-style house built the same year he moved from Philadelphia, where he was raised and where he studied at the Pennsylvania Academy of the Fine Arts. The lure of Island Heights may have been its natural beauty. However, his move was motivated by a job playing the cornet at the town’s Methodist camp meetings. Island Heights, founded in 1878, was originally a religious resort. It is still a “dry” town, meaning the sale of alcohol is banned. It is also an artists’ colony, “a true haven,” Ms. Askoff said. “There’s something about the light here and the sand and the water,” she said. Mr. Peto, though, focused on indoor vistas in his work. He was particularly drawn to everyday objects and eventually was celebrated for his ability to trick the eye with his realistic images. In the 1950s, it was discovered that signatures on his work were sometimes painted over and the works passed off as originals by his better-known Philadelphia contemporary William M. Harnett. “They had a little bit of a different style of painting, but at one point in the ’50s, a Rockefeller let it be known” that he had inadvertently bought a Peto instead of a Harnett, Ms. Askoff said, adding, “So Peto began to be rediscovered after that.” The artist had “another resurgence” in the early 1980s, with an exhibition of his work at the National Gallery of Art in Washington, she said. There are three paintings by Mr. Peto in the museum’s permanent collection, all donated by local patrons. And though Ms. Askoff has borrowed art from galleries for each exhibition, the bulk of the works by Mr. Peto displayed by the museum have come from local private collections. A number of Mr. Peto’s still life paintings are on display, along with objects he painted. Many of them have been “hidden away in the back of Island Heights closets,” Ms. Askoff said. The furniture in the two-and-a-half-story house, painted inside and out in vivid Victorian-era colors, never left the premises, though. When the Peter R. and Cynthia K. Kellogg Foundation bought the Peto residence in 2005 and paid for its restoration, many of Mr. Peto’s artifacts were still inside. Mr. Kellogg had the history of the house researched, “and he saved it” from a developer who planned to tear it down, according to Donald Roberts, a trustee who led a visitor on a recent tour, along with Ms. Askoff. “All the furniture was in the house when Joy died. It was extraordinarily cluttered,” Mr. Roberts said. Photographs helped determine which pieces were in the house when Mr. Peto lived and worked there, and where they were positioned. Now, the Peto Museum displays several still lifes of household objects he painted alongside the actual items that inspired them. And the items have been restored, as closely as possible, to their 1890s-era settings. Temporary exhibitions range beyond Mr. Peto’s work to encompass that of other artists. To assemble “Island Heights and Beyond: The Artists’ Colony,” a new exhibition scheduled to open this weekend and run through Aug. 25 at the museum, Ms. Askoff did a lot of “shaking the tree,” as she called it. “You start looking around, unearthing things, and next thing you know, there are all these connections. You never know what you’re going to find next,” said Ms. Askoff, who is also vice president and chairwoman of the museum’s arts committee. “Island Heights and Beyond,” a multimedia show, will include the paintings by Mr. Peto from the permanent collection, along with more than 70 works culled from about 30 artists who worked, or continue to work, in Island Heights or in nearby towns. “Sylvia” and “Sketch of Sylvia,” a pair of 1909 portraits by the local artist Carl Buergerniss, who died in the 1950s, for example, are among the works that will be on exhibit. “Sylvia,” a small painting of a young girl, was borrowed from an Island Heights resident. “Sketch of Sylvia,” a smaller, rougher portrait of the same girl, was lent by a different island family. The owners of the two Buergerniss works know each other, but neither knew the other owned a “Sylvia,” Ms. Askoff said. In addition to collectors, Ms. Askoff’s tree-shaking for the new exhibition extended to the artists. A small upstairs room is dedicated to artists’ responses to Hurricane Sandy. Island Heights was hit hard by the storm, Ms. Askoff said. The museum was not damaged, but it closed from November until May 4 “to regroup,” she said; normally it would close in January and February only. Without them, Mr. Roberts and Ms. Askoff acknowledged, the Peto Museum would not have many trees to shake, and the paintings it prides itself on presenting would not have materialized. “Finding works that have been handed down, that all of a sudden show up, is the most exciting thing,” Mr. Roberts said. “Island Heights and Beyond: The Artists Colony,” through Aug. 25 at the John F. Peto Studio Museum, 102 Cedar Avenue, Island Heights. Open Saturdays and Sundays 1 to 4 p.m. and by appointment. Information: (732) 929-4949 or petomuseum.org.